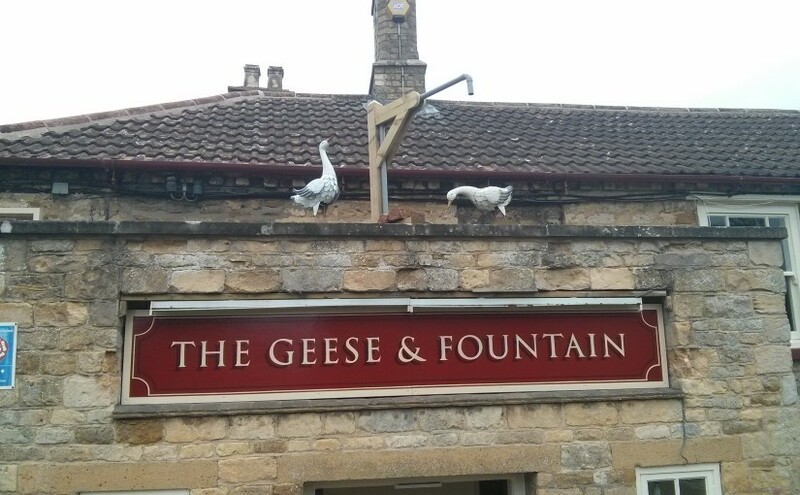 The Geese and Fountain is a traditional welcoming village pub in the lovely Leicestershire village of Croxton Kerrial, about five miles west of Grantham and the A1, and nine miles east of Melton Mowbray. Re-opened in 2015, this village inn has two wood fires, and a quiet and welcoming atmosphere. There is no juke box or fruit machine, but occasional folk or blues nights supplement the hum of conversation. Dogs, children, cyclists and walkers are all very welcome. We are listed in the Good Beer Guide, and were chosen by our local CAMRA branch (Vale of Belvoir) as their “Leicestershire Pub of the Year”. Beers from six local breweries always feature (Oldershaws, Belvoir, Brewsters, Oakham Ales, Grainstore and Nobby’s), together with a number of guest beers from other local microbreweries. In addition to five handpulls of local real ale, the Geese and Fountain offers three locally brewed lagers (currently Freedom Four, Brewsters Helles and Nobby’s Pilsner), two kegs of local craft beer (currently Framework Brewery’s imperial coffee porter and Shiny Brewery’s Wrench stout), a sparkling medium cider from Thirsty Farmer in Nottinghamshire, and at least three real ciders (currently Spalding Scrumpy, Thirsty Farmer Medium and Hallaton Bottle Kicking Scrummage). The pub serves breakfast (8.30am until 10.30am), lunch (midday until 3.00pm) and dinner (6.00pm until 9.00pm), with afternoon tea on Sundays between 4pm and 8pm. There are seven en suite letting rooms for Bed & Breakfast, each with its own individual style. Perfectly situated for visitors to Melton, Grantham, Rutland Water, the Vale of Belvoir, Leicester or Nottingham, or travellers heading up or down the A1, the pub is an ideal destination for cyclists, walkers and bird-watchers. … and to find out more about the local produce we serve, we’d invite you to find out more about our ingredients and suppliers.